We are a well-established taxi company based in the heart of the Norfolk Broads, between the city of Norwich and the coastal resort of Great Yarmouth. We have been operating since 1996 and offer a professional, friendly service. We cater for various types of travel, both local and long-distance, and have a variety of vehicles to suit your needs. 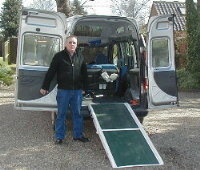 These include a wheelchair vehicle with ramp which can accommodate any type of wheelchair, and an eight-passenger minibus. Our first priority is the comfort and safety of our customers. All vehicles are inspected by the Ministry of Transport and all carry first-aid kits and fire extinguishers. We also provide booster seats. All drivers hold a Hackney Carriage/Private Hire license issued by North Norfolk District Council, our local licensing authority, and all are police checked via the Criminal Records Bureau for the conveyance of school children. Our drivers undergo a course with Norfolk County Council under the Passenger Assistance Training Scheme (PATS), and also take first-aid courses. We have fully trained escorts who can travel with passengers when needed, mostly to cater for such requirements on journeys for social services. We can provide courier services for the delivery of urgent documents or packages. We welcome contracts from individuals, private companies, and public institutions, and are pleased to offer competitive quotes for regular journeys. We like to consider ourselves one big, happy family and pride ourselves on being able to provide a professional, courteous, and personal service to all our customers. We do have job vacancies for drivers and office staff from time to time, so if you are looking for work please check our Vacancies page to see any current openings.